MASSIVE REDUCTION 4 bed villa right in the heart of the Golden Triangle - Property for sale. Full Description: Right in the heart of the Golden Triangle is this completely renovated 4 bedroom villa. Located in the exclusive Vale do Garrao area of Almancil between the prestigious resorts of Quinta do Lago and Vale do Lobo. Built over 3 levels the villa comprises on the ground floor, an entrance hallway, lounge/dining room with fireplace, fully fitted and equipped kitchen with utility room, 2 bedrooms, office and shower room. Upstairs are 2 en-suite bedrooms, the master with a shower and a bath and doors to a private terrace. From the hallway is direct access to the huge basement and garage area which has remote entry from the driveway through remote entrance gates. Outside the plot is laid mainly to lawn with feature lighting, mature pine trees and swimming pool. The newly renovated property benefits from air conditioning, double glazing, electric shutters, alarm, video entry system and much more. 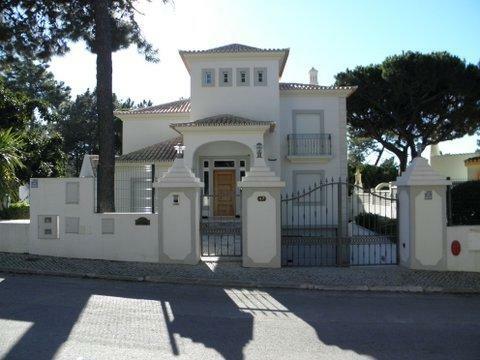 This is a desirable property in an excellent location just 500 metres from the beach and with some of the best golf courses and Michelin starred restaurants the Algarve has to offer right on your doorstep. Viewing is highly recommended.